What better way to celebrate than a party or gathering in one of Greater Victoria's beautiful parks? Most parks have picnic areas free to use on a first-come-first-serve basis, however there's some awesome spots that you can reserve ahead of time to make sure your whole group can be accommodated. One often overlooked idea for birthday parties is reserving for a group picnic in one of Victoria's stunning outdoor settings. From lake-side to ocean-side to being immersed in a forest, there's plenty of options for your next gathering! 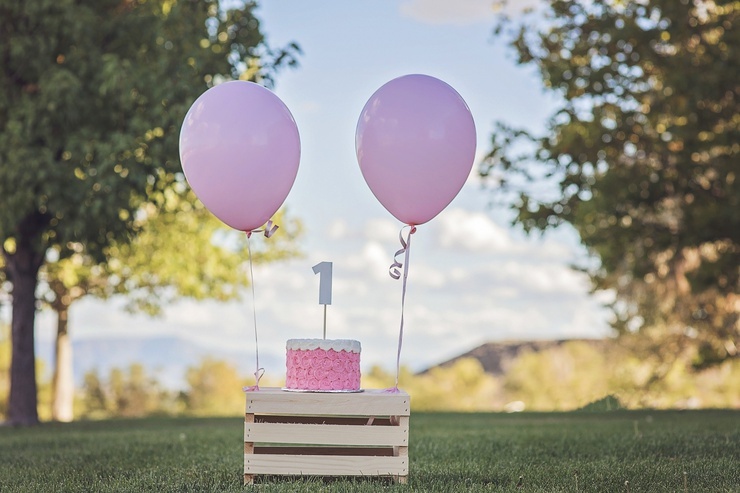 Essentially all parks allow day-use for groups on a first-come-first-serve basis, but we've gathered the picnic areas that allow for reservations and accommodate larger groups, perfect for your child's next birthday party. 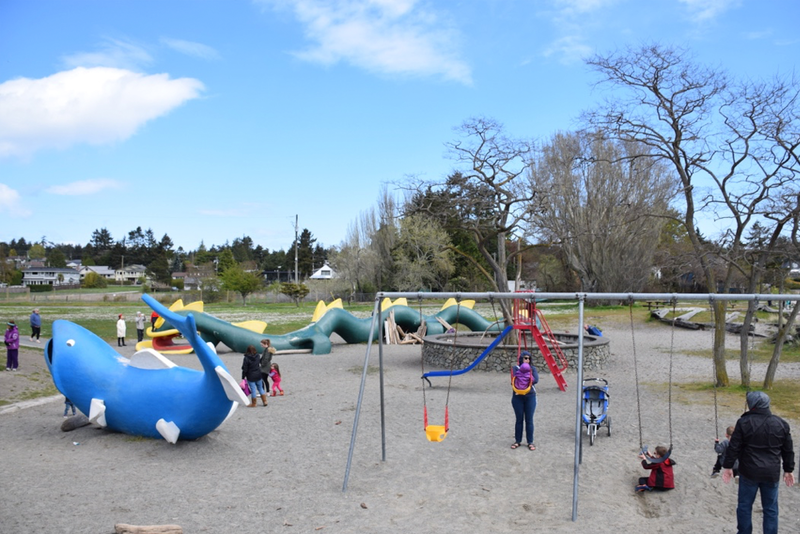 One of the most popular playgrounds in Greater Victoria! Kids love the sea-themed structures and it's right along a long sandy beach, with plenty of room to run and play. There's actually 8 total picnic areas available to be reserved in varying parts of the park, depending on what you'd like to be closest to. Cost- $20.50 to reserve for up to 4 hours. $33.75 if it's for over 25 people. Reserve on the Saanich Parks & Rec website. 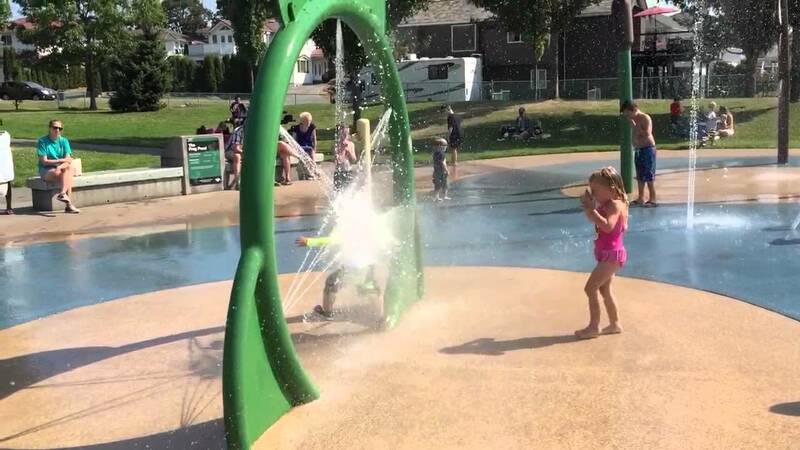 There are five picnic tables available around the playground and water park areas, especially a hit for summer birthday parties so the kids can splash away in the free water park! 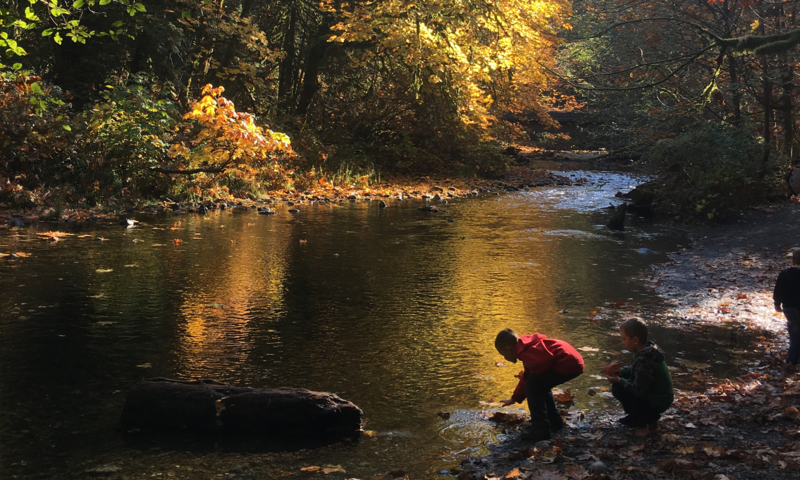 With plenty of area to play and trails weaving through a Garry oak forest next to ponds, it's a great spot to spend the day. 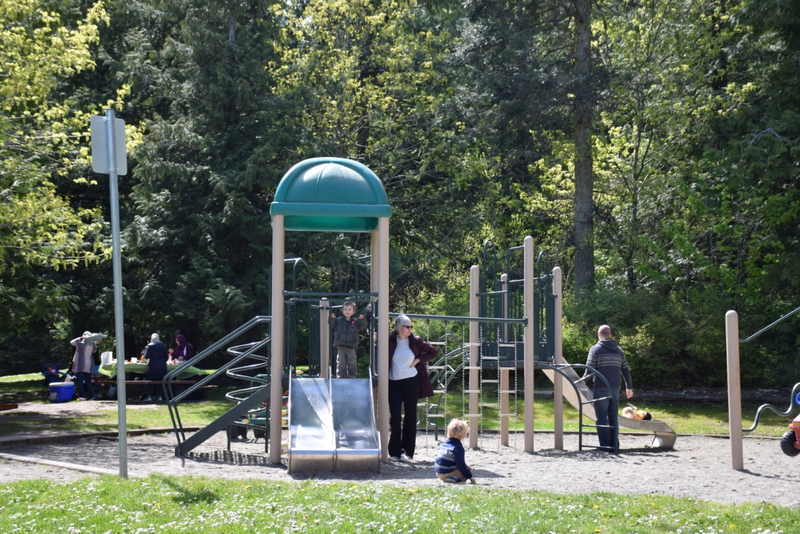 This is the largest and most magnificent park administered by Saanich and you likely know about it for its 360 degree lookout from the top and lush family-friendly trails. Did you know you can also walk the shores of Cordova Bay in this park? 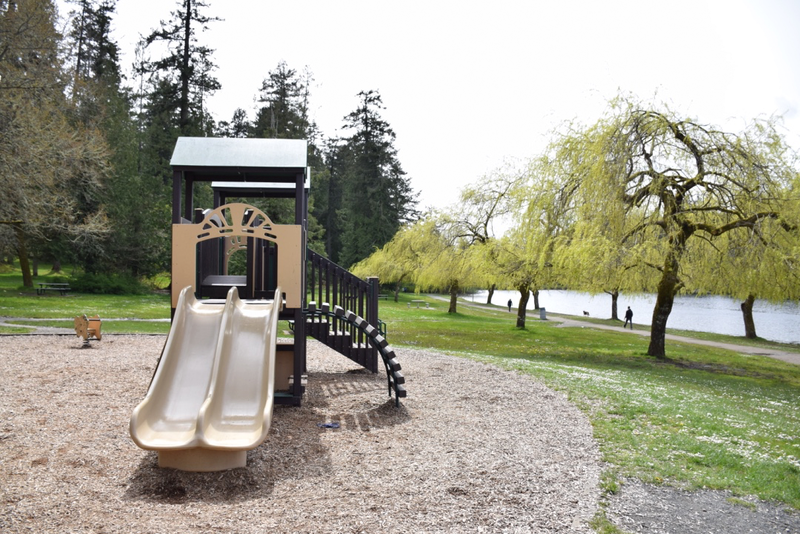 There are two large picnic areas near the lower parking lot by the beach, one located right next to the playground and open field (great for playing games or free time). Along the stunning 10km loop, there's two picnic shelters to choose from, one at Beaver Lake near the filter beds and the other at Eagle Beach near the rowing centre. 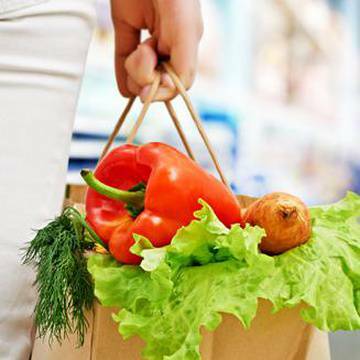 Both have accessible washrooms, drinking water, sheltered picnic tables, and BBQs permitted. Cost- $40+GST. Reserve online on the CRD website. There's five separate picnic areas in the park available to be reserved, all near a parking lot or accessible by hiking through the trails. The top of Mt Tolmie boasts panoramic views of Saanich and Victoria across to the Olympic Mountain Range and to Mt. Baker in the Cascades. There's plenty of pathways to explore! The only downside to this area is that there are no public washrooms nearby. Looking for a beach day? 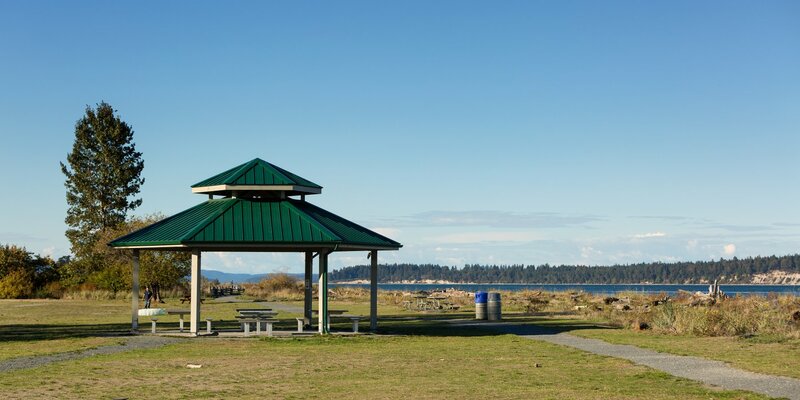 Overlooking the long, sandy, log-filled Island View beach is a sheltered picnic area that easily accommodates 16 seated. There's no running water but toilets nearby and BBQs are permitted. Kids will love spending time on the beach building forts or finding crabs underneath rocks! This beautiful park has a large day-use picnic area with a picnic shelter, woodstove, washrooms, fire rings and numerous picnic tables. Nature walks and trails of varying lengths starting at the day-use area offer the opportunity to see some of the park’s more notable features, like the gigantic trees, views of the stream, even a waterfall. The Freeman King Visitor Centre can be reached by a short trail from the day-use area parking lot, which is open daily year-round.  Cost- $50 per group. Reserve on Discover Camping website.